Beautiful lighting without a shadow of a doubt. Lighting is an integral part of any cue sport or games room experience. With the beauty and masterful craftsmanship that goes into a table’s design and performance, it’d be a huge shame not to show it off. We can handle the logistics when it comes to placement and any worries you happen to have concerns about. A lot of measurements and details needs doing to ensure your perfect lighting can go on and off without a hitch. Even with putting aside a table’s beauty and aesthetic, lighting is extremely important. How can you expect your game experience and playing level to be at its best otherwise? For customers and guests who are night owls, we can make arrangements for dimmer or softer lighting. For those playing during the day or putting tables in rooms with a lot of windows, that’s important context as well. Choices in brightness, burn temperature, and light trajectory can make all the difference. 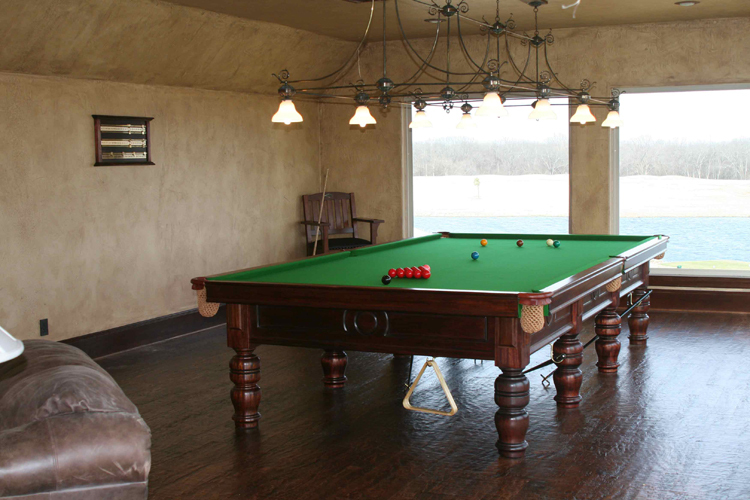 At the end of the day, this careful planning for the room itself will honour your billiards, snooker, or pool table. Any vintage, any size, and any theme you desire. 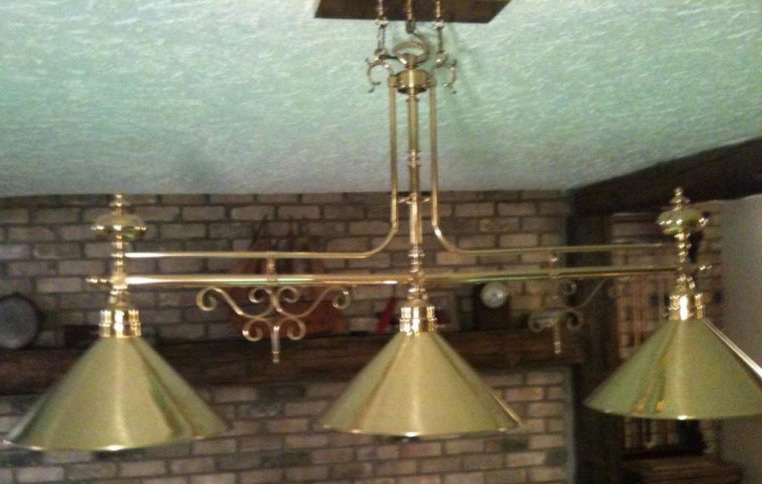 Antique and vintage lamp shades are well within our capacity to support. If you’re looking to recreate a particular style or a certain timeframe for your games room, we’re all about it. Having worked with designs from late 19th century snooker all the way up until modern high-end and luxury tables. 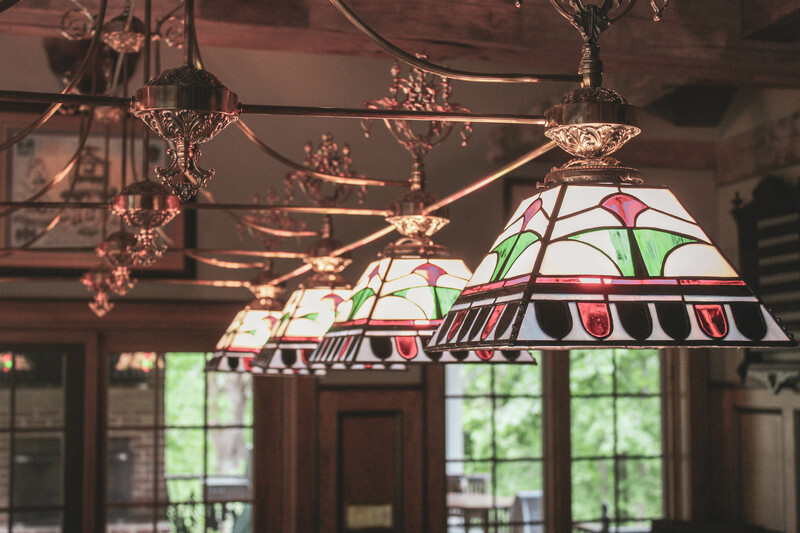 Whether you’re looking for delightful stained glass or sharp-edged hardwood, we’ve got the experience and expertise to assist you. Sourcing out original is something our team of experts is no stranger to. That said though, provided you have a dream and a design in mind, we’re able to reproduce many of them to suit original pool table styles. 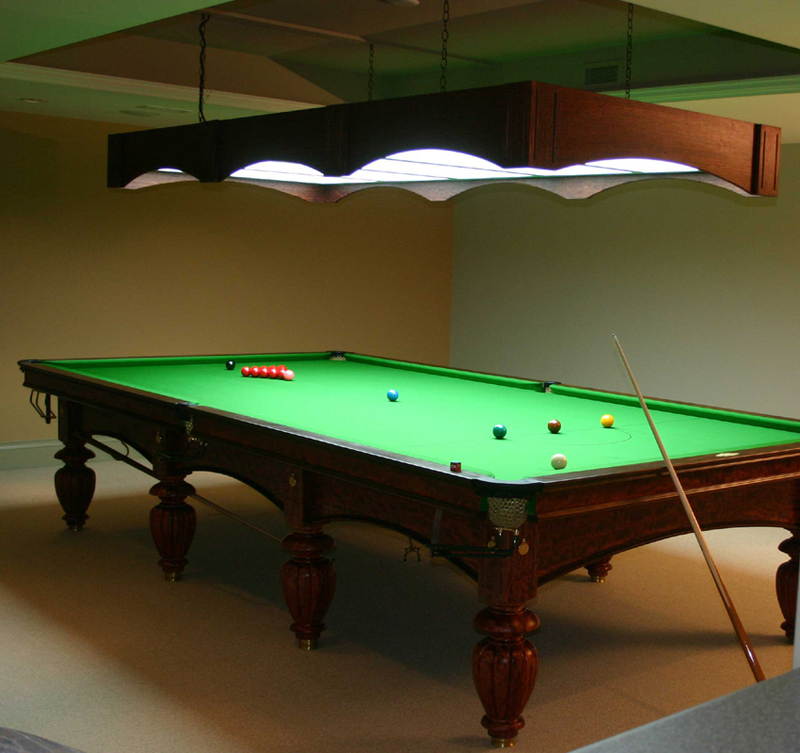 No two tables or rooms are ever built the same way, so we encourage you to dream big when it comes to ensuring your games room is everything it ought to be. The details can make all the difference for enthusiasts and those who appreciate the game as much as we suspect you do! Tailored decor is only the beginning. 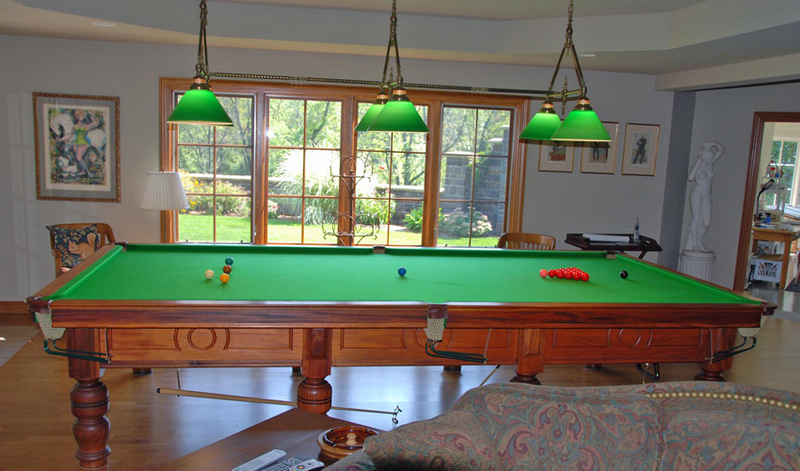 Dim or poorly-angled light can lead to a suboptimal billiards experience. Ball shadows can alter your decisions about cue placement and power in a sport where every minor change makes all the difference. That said, too much lighting can take away from the atmosphere of the room. Nobody wants a game night to feel like its hosted in an office building or department store – that’s just bad news all around. Getting that precise effect though? Priceless. Finding a balance tailored to your style and personality in your games room starts with you. Whether you know exactly what you’re looking or not, you’ll need capable designers to work with. 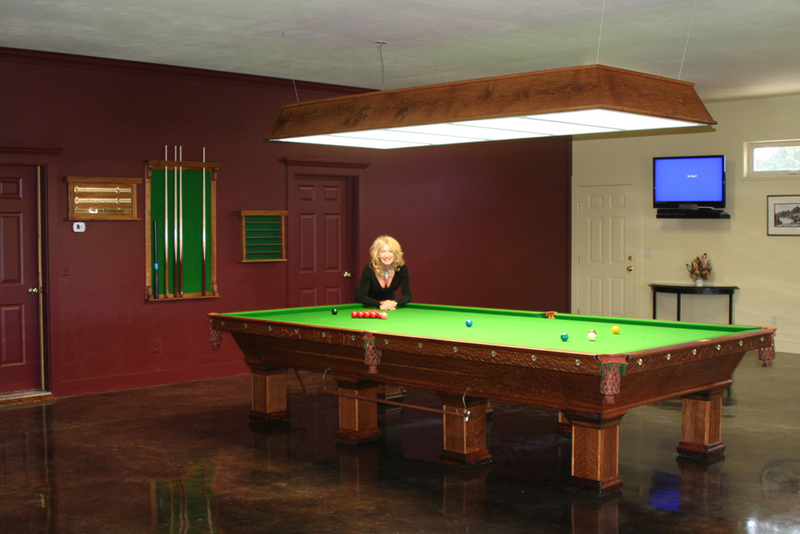 We’ve been in the custom cue sport table business for long enough to know what works when it comes to custom lighting. If you’re not sure of where to start on your next room upgrade or electrical project, we’d love to hear from you!